Truth or Dare questions and challenges can sometimes get out of hand if left to the party goers own devise. 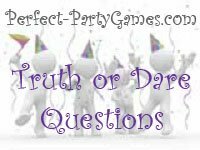 Here, you will find a list of Truth Questions and Dare Challenges that you can use at your next teenagers party. The best way to utilize these truth or dare questions and challenges are to print them out and cut into strips. Place the questions in one jar and the challengers in another jar. Let the guests pick there own when asked "Truth or Dare!" If you just want it done for you, consider purchasing the Truth or Dare Box of Questions by Melissa and Doug. What do you still like that you wish others didn't know about? If you could make anyone like you, who would it be? Who would you like to eat with once, the person can be dead or alive? Tell the group something about yourself they don't already know. If you could decide where to live for a year, where would it be? If you had $1,000 and had to spend it all today, what would you buy? What do you plan on naming your first son or daughter? Do you talk in your sleep. If so, have others told you what you have said? Where is the strangest place you have ever broke out laughing? Do you still sleep with something favorite like a blanket or stuffed animal? How old were you when you last owned pajama's with feet in them? Would you rather be a famous singer or famous actress? Why? Have you ever played sick and stayed home? Why did you play sick? Tell something you like most about each person in the room. What is the most annoying thing about the person to your right and left? What was the worst lie you ever told? Did you get caught? Name two people in the group that you could live with for a year. Why? What was the meanest thing ever said to you or about you? If you could change places with the opposite gender for a day, would you and why or why not? Is there one thing you still won't tell your parents you have done? refer to our Get to Know You Questions. Text three friends you know and tell them "I am AWESOME"